George R.R. 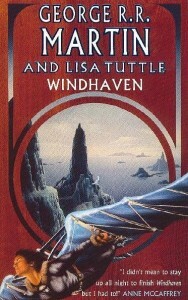 Martin's third novel was “Windhaven”, a collaboration with Lisa Tuttle. It is a change of pace from his more suspenseful novels and lacks the epic scope associated with some of his better-known books; this is a comparatively prosaic tale of a young woman challenging authority. The planet of the title is a largely oceanic world, with only a few small islands for humans to survive on. After a wayward colony ship crashlands on the planet, the survivors build a low-technology community on the small islands. As the name suggests, the planet is extremely windy and the ocean is inhospitable – sailing between the islands is quite risky, and prone to frequent delays in bad weather. One of the main forms of communication on the planet is carried out by the Flyers. These people take advantage of the perpetual strong winds to fly between the islands, using wing-like gliders built from material scavenged from the crashed spacecraft. The Flyers need a great deal of skill and physical stamina, but the best of them are capable of flying for hundreds of miles. Over the centuries since the crash the flyers have become an elite on the island – the wings being handed down from father to son. Maris, a young woman of common birth adopted by a Flyer, decides to challenge the society's traditions, in an attempt to earn her foster-father's wings instead of her brother Coll – especially in light of the fact that her foster-brother doesn't like flying and would rather be a minstrel. Of course, conservative elements in the society are opposed to this move, while more liberal people want those outside of the elite to have a chance of becoming a Flyer. The novel is split into three sections separated by a number of years telling the stories of various stages of Maris' confrontations with the hidebound authorities of her world. This is a fairly un-ambitious story, reminiscent of Anne McAffrey’s “Pern” series, and disappointingly predictable considering the audacious and surprising plotting features in many of Martin's other stories. The characterisation is reasonable but none of the characters manage to be particularly memorable and although Windhaven's society is reasonably interesting it doesn't really get the same depth of world-building as some of Martin's other books. Despite this, it is still reasonably entertaining and quite well written, although it is probably the weakest of Martin's novels and suffers a bit from comparison to them.